Australia has released NAB Business Confidence and the US will publish JOLTs Job Openings and API Crude Oil Stock Change. 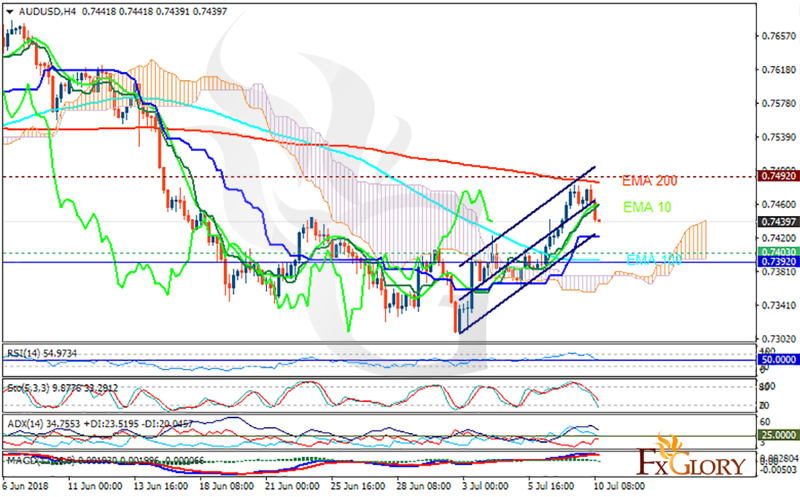 The support rests at 0.74030 with resistance at 0.74920 and they are both above the weekly pivot point at 0.73920. The EMA of 10 is moving with bullish bias in the ascendant channel and it is below the EMA of 200 and above the EMA of 200. The RSI is moving on the 50 level, the MACD line is below the signal line in the negative territory and the Stochastic is showing downward momentum. The ADX is not showing any clear signals. The price is above the Ichimoku Cloud and below the Chinkou Span. The Tenkan-sen is showing an upward trend and the Kijun-sen is showing a horizontal trend. The price decline towards the weekly pivot point may push the rate towards 0.735 while this level will remain the floor. Buyers can also target 0.75 if the resistance level is broken.